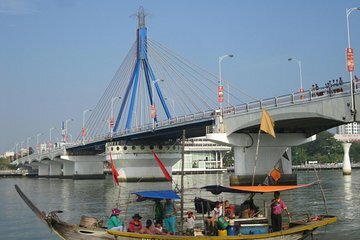 Travel with an informative guide along the the Son Tra Peninsula from Da Nang. Your full-day itinerary includes the Goddess of Mercy, aka Lady Buddha, a 17-floor Bodhisattva statue at Linh Ung Pagoda. Visit Non Nuoc, a centuries-old stone carving village located at the foot of the Marble Mountains, and explore Huyen Khong Cave. Hotel pickup and drop-off included.